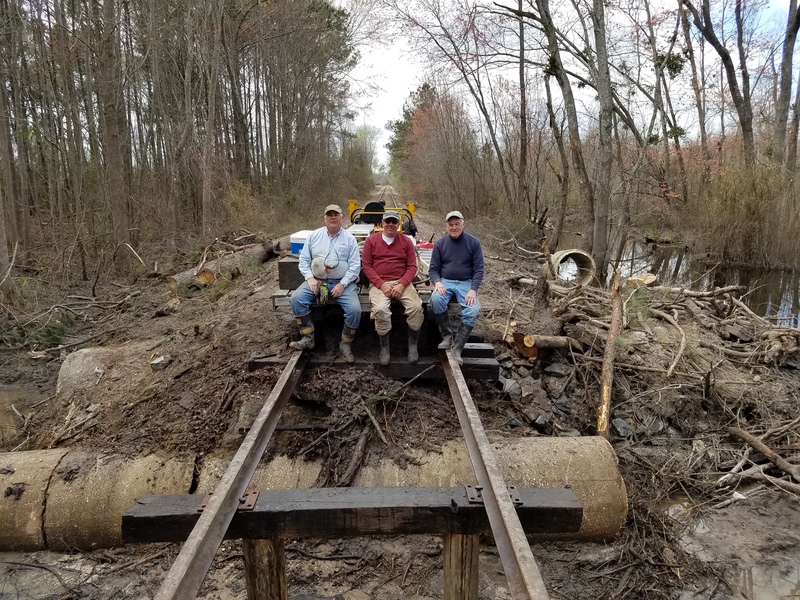 Our 100-tie project at McNatt’s , vicinity MP 225, was completed yesterday (January 27, 2018). 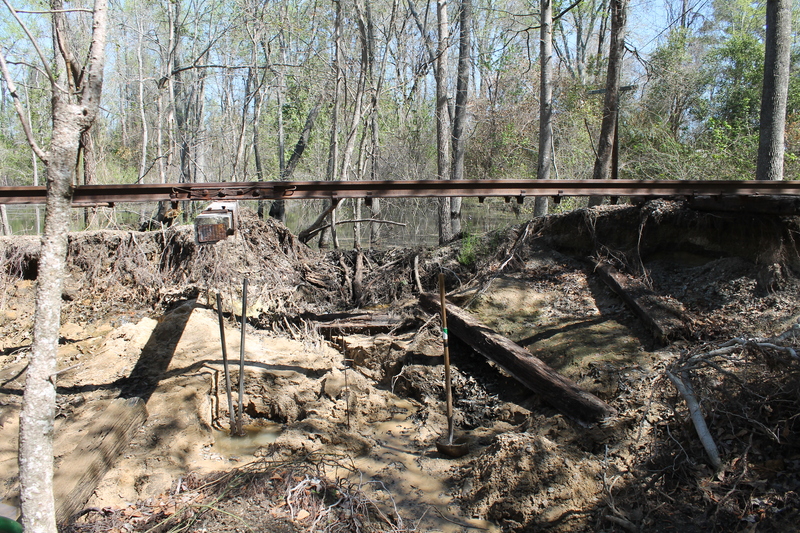 Also, seven of the washed-out ties between Mountaire and Lewis Farm Rd were put back in. 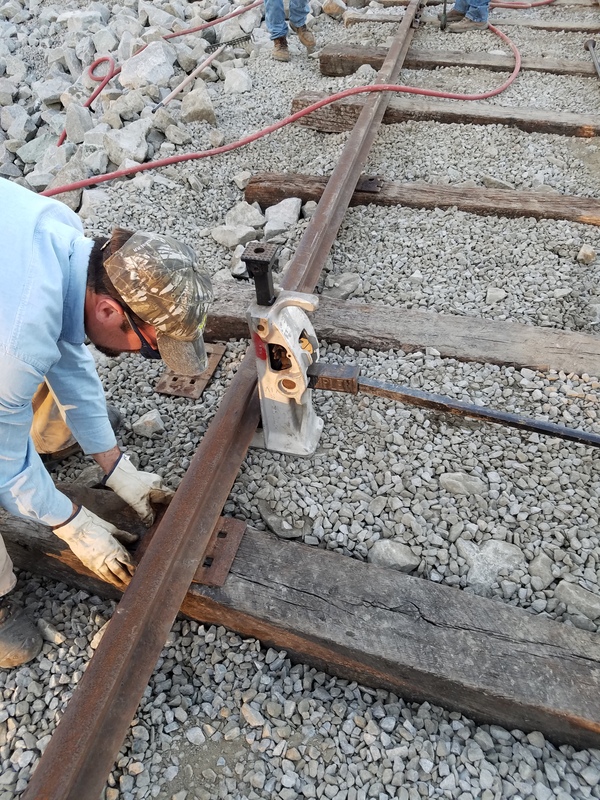 These seven ties need some manual tamping; darkness kept our team from taking care of it. 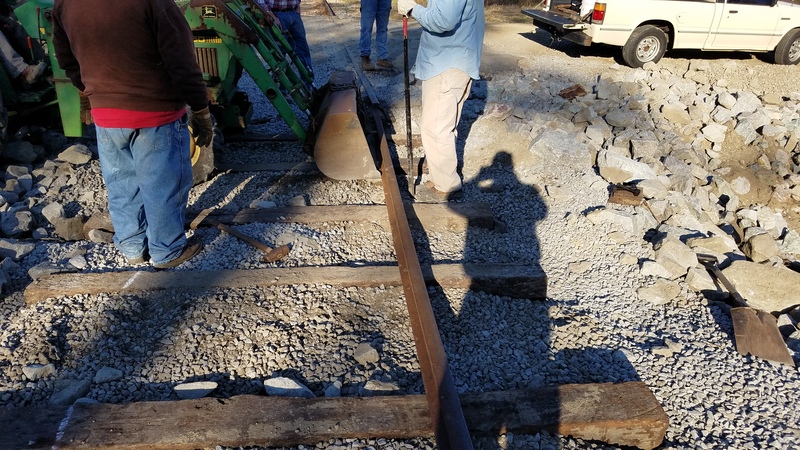 Anyone riding the line is encouraged to bring along shovel, suitable tamping device, and a little elbow grease to help improve the site. 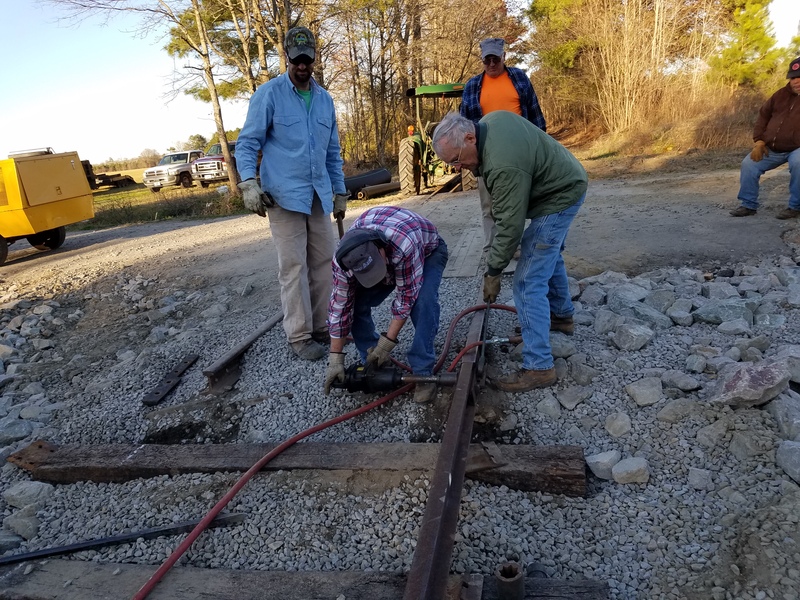 Contractor Phillip Bundrich began installing 100 cross ties in the Mallory Road curve on December 18, 2017. 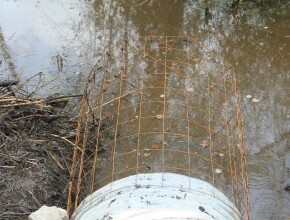 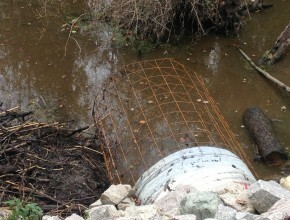 Several members installed beaver guards around the two culverts near Parkton on Saturday, December 2. Mark used his S2 motorcar to move equipment from Parkton to the site. 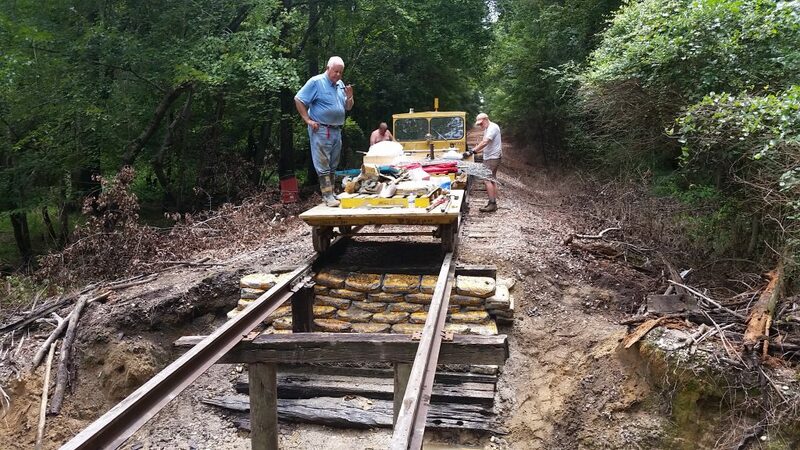 Those who helped with the project are Mark Bullard, Phil Gandy and George Newport. 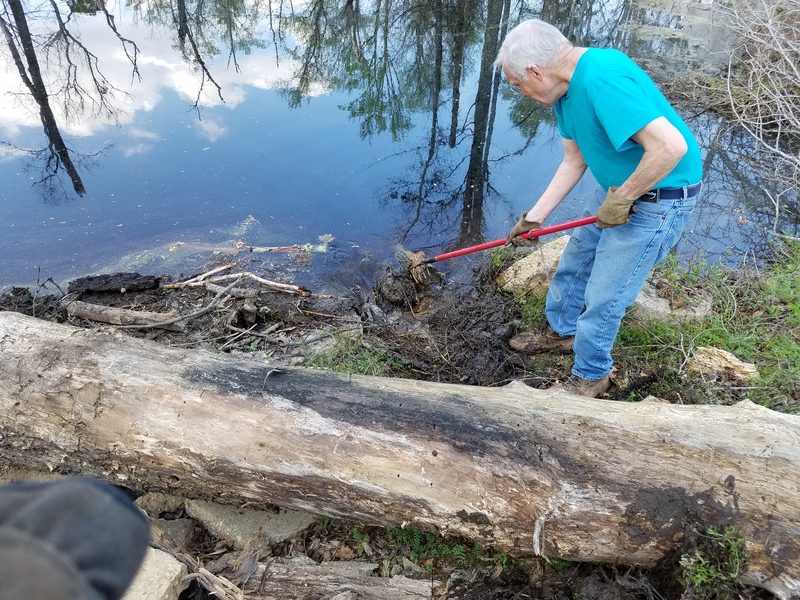 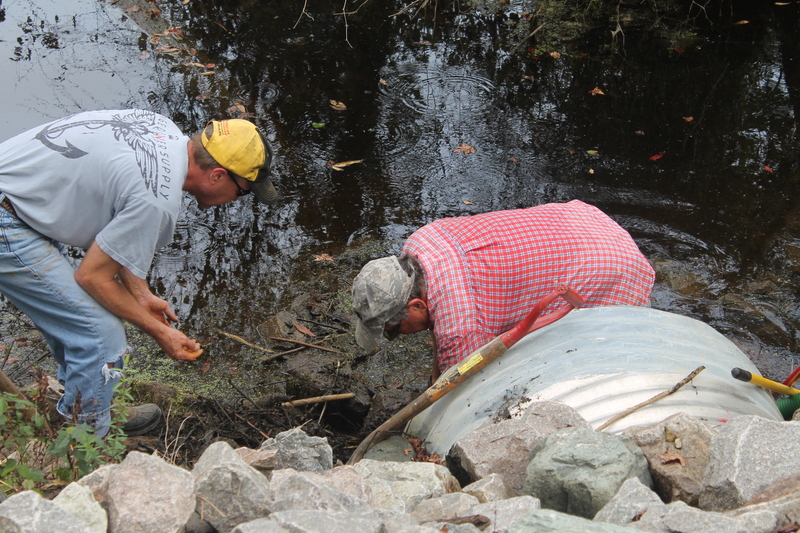 Recently some of our members met at Clearwater to clean out debris packed in our culvert by beavers. 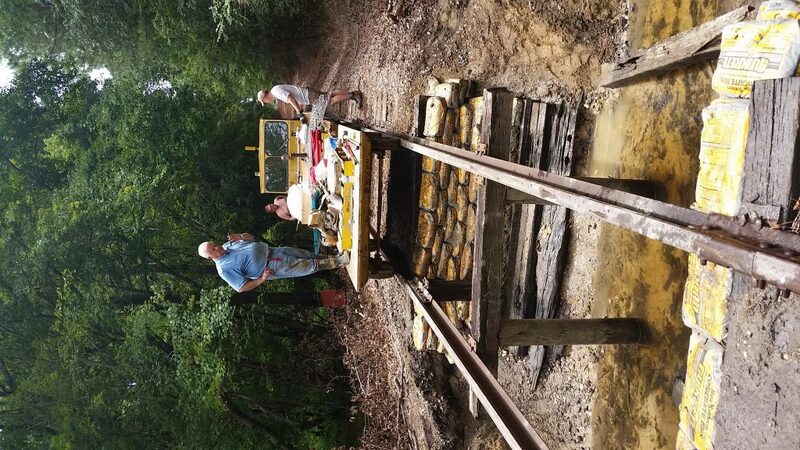 Our team was led by Mark Bullard, with much help from George Newport and Tim Parnell. 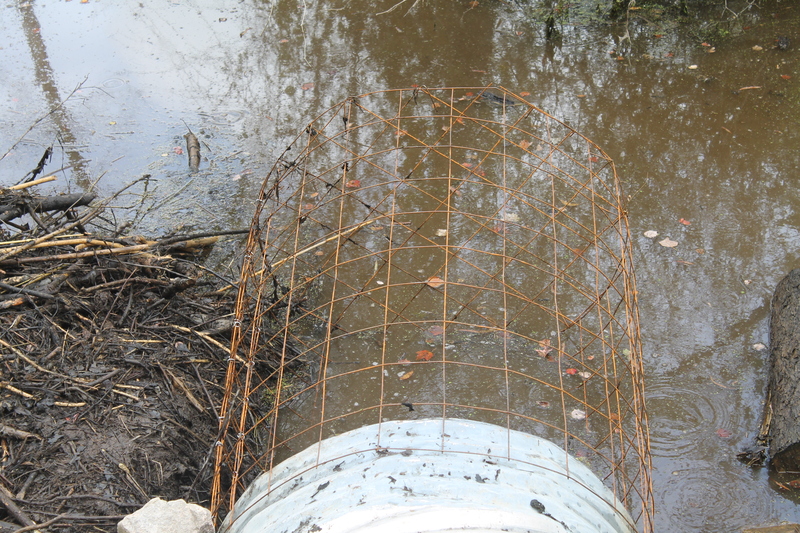 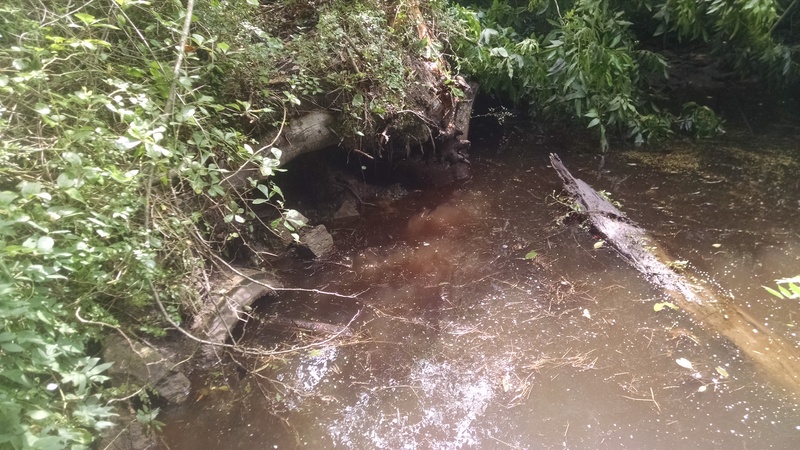 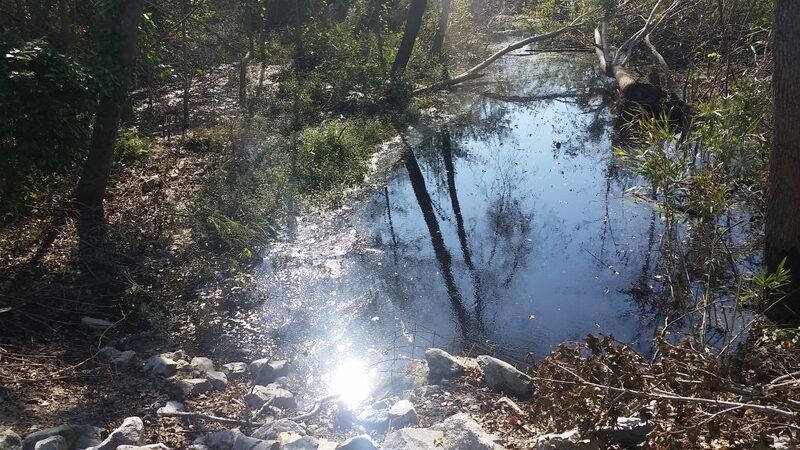 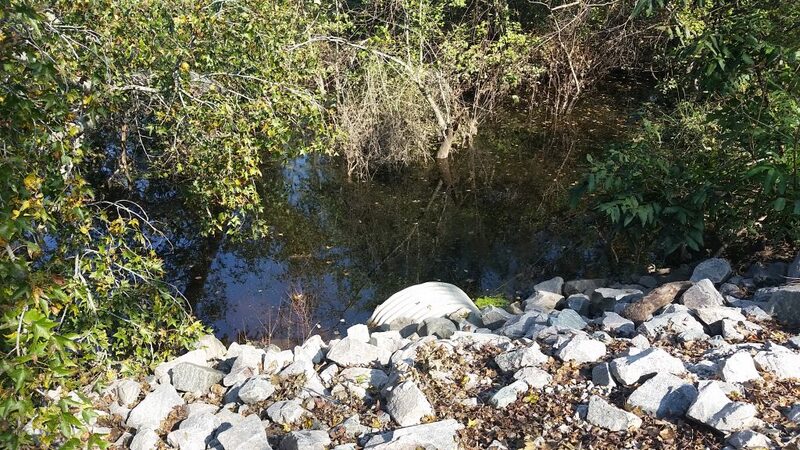 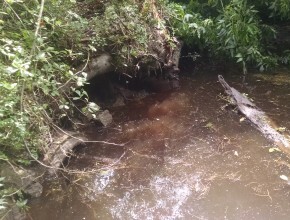 The culvert is fully open again, and heavy wire screening at culvert ends was fashioned to hopefully prevent future entry of beavers and their associated water-blocking materials. 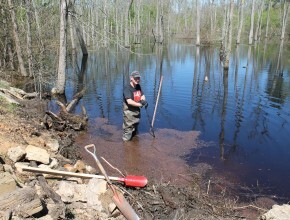 This work required getting down in the swamp muck, entering places most folks dare not go, and getting done a dirty job. 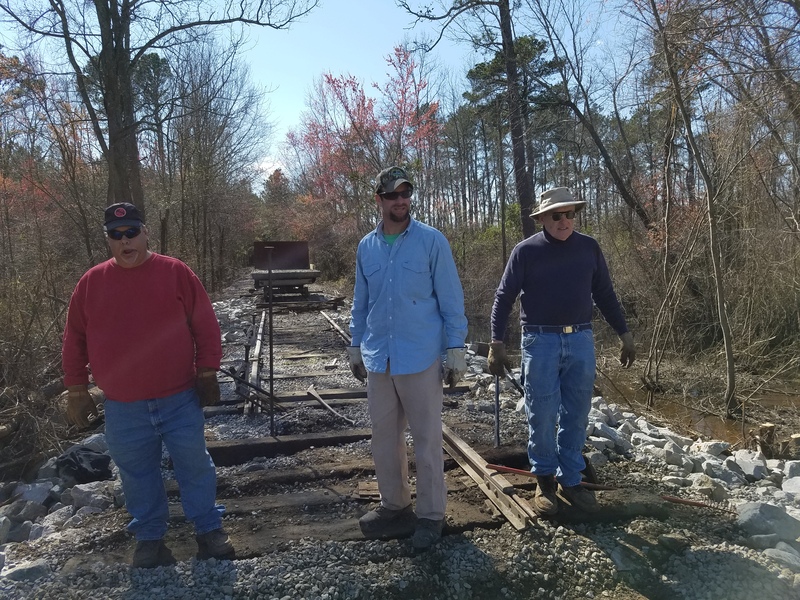 Much thanks goes to these fellow RS&N recreational railroaders! 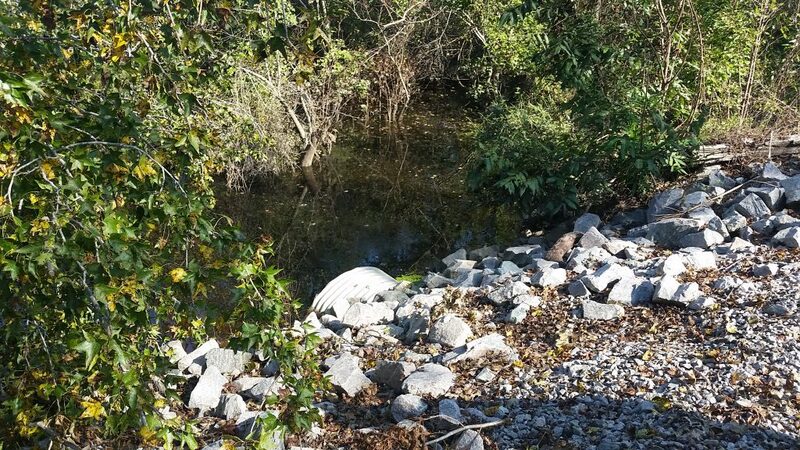 Attached are a series of pictures taken by Doug Bedenbaugh after the contractor has cleared the culverts inlet at Parkton. 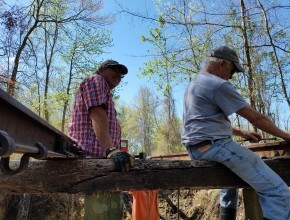 Eight members turned out for the workday. 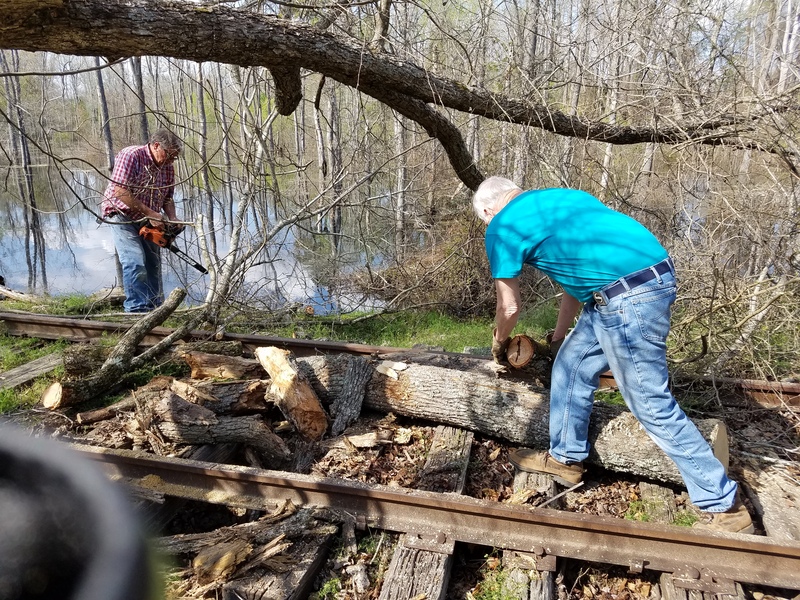 The RSN April 1 work crew consisted of Mark Bullard, Doug Bedenbaugh, George Newport, Tim Parnell, Eric Massey, John (Chef) Shefte, Tom Stallings, and Phil Gandy. 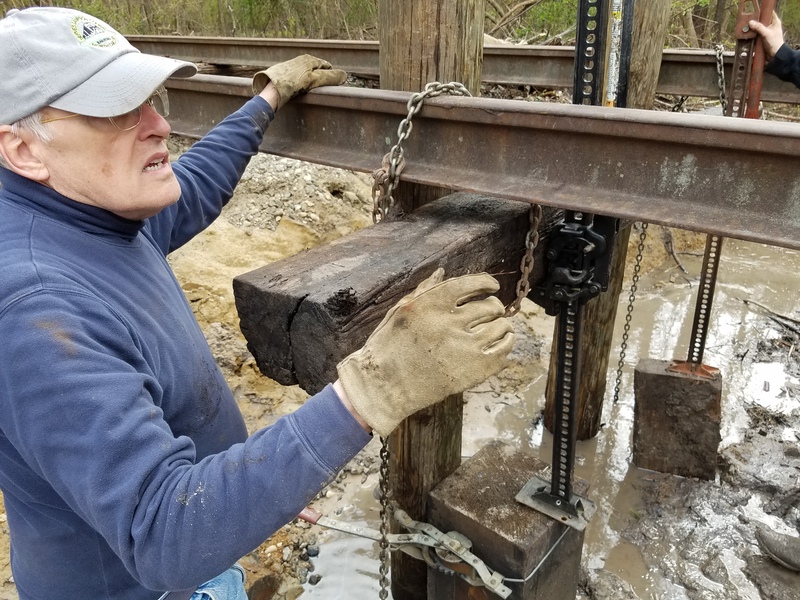 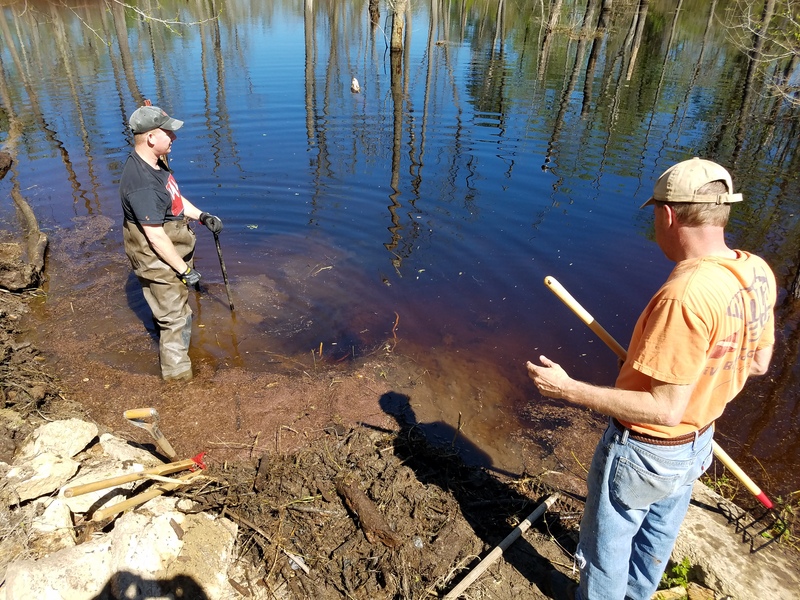 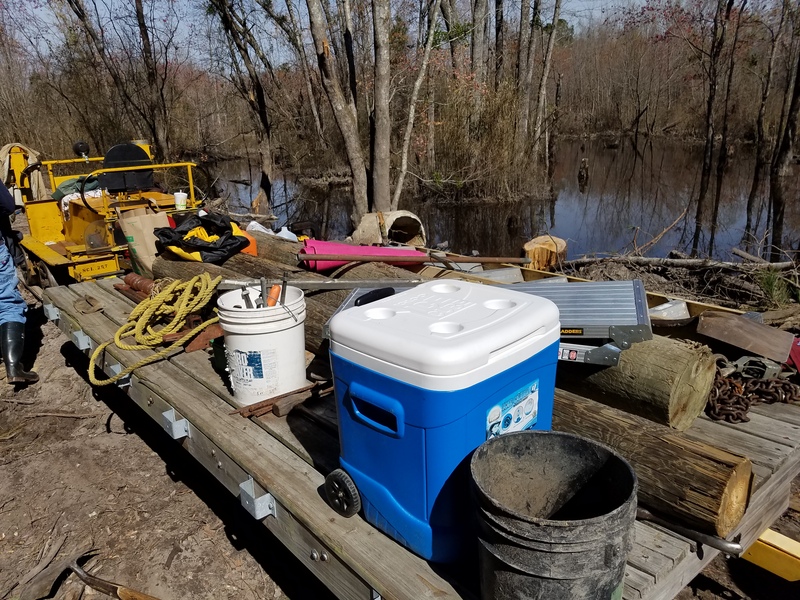 Mark had done quite a bit of planning for this project; he purchased the 8x8x10’ treated poles and bought a larger water pump for washing the pilings down. 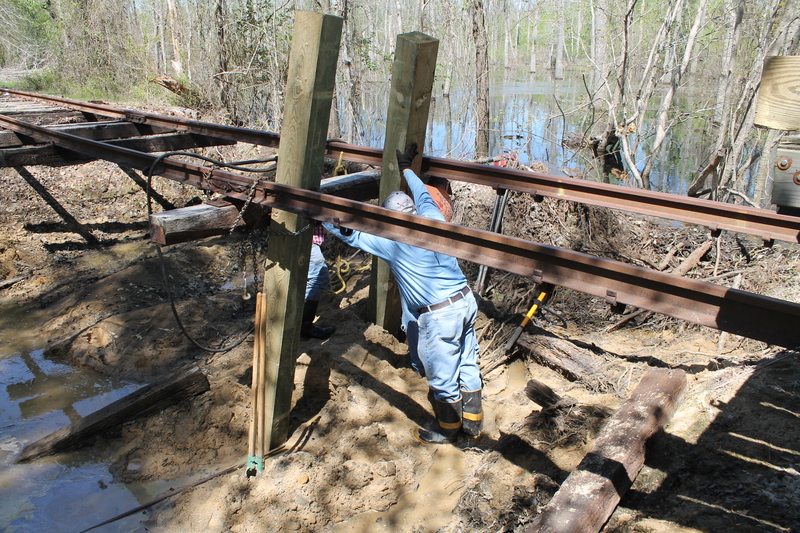 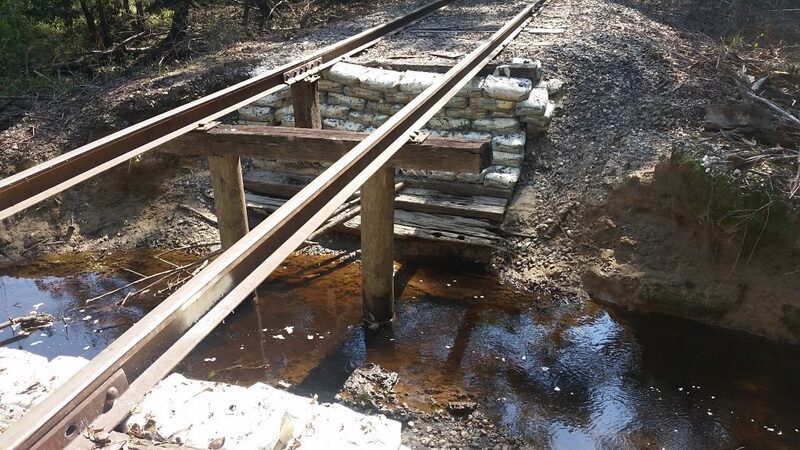 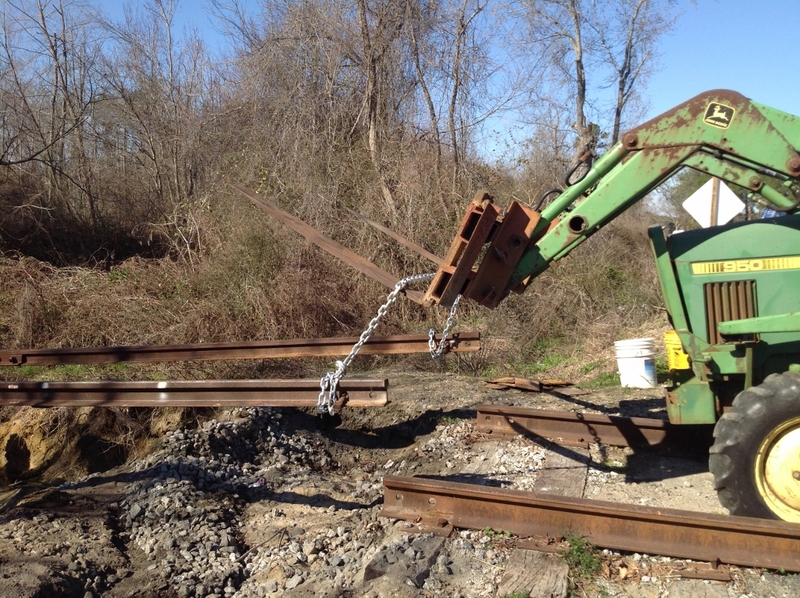 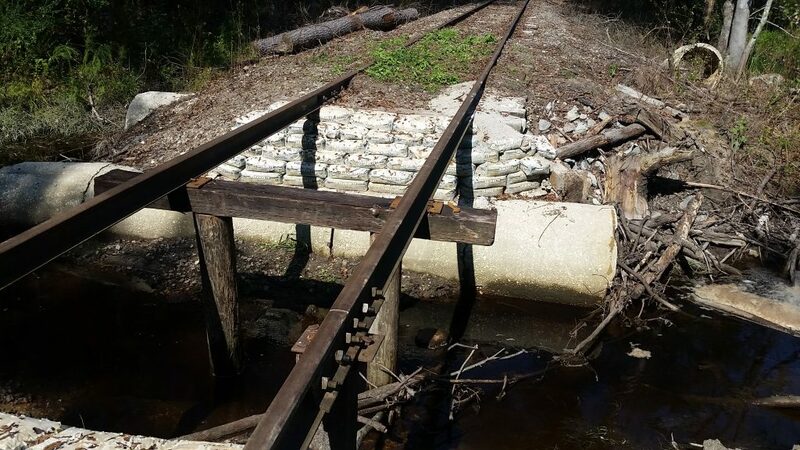 We were able to install two piers to support the rails over the Parkton washout. 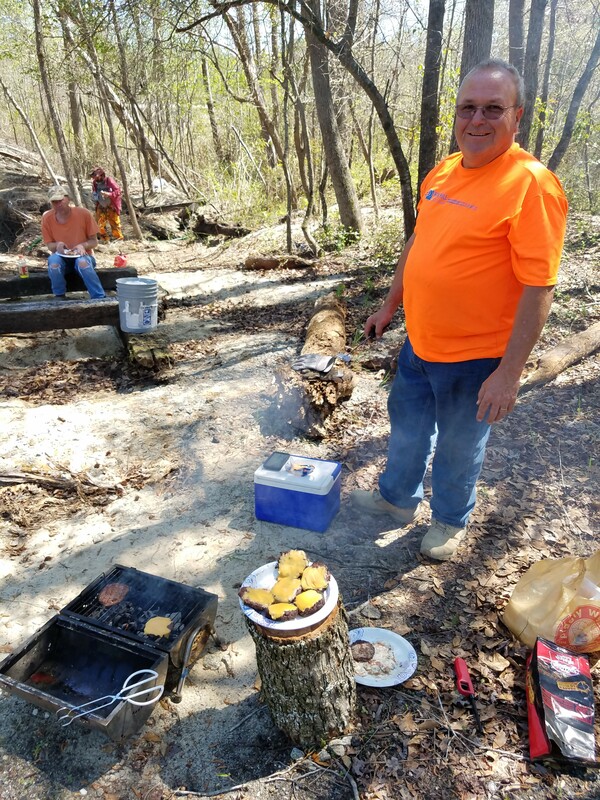 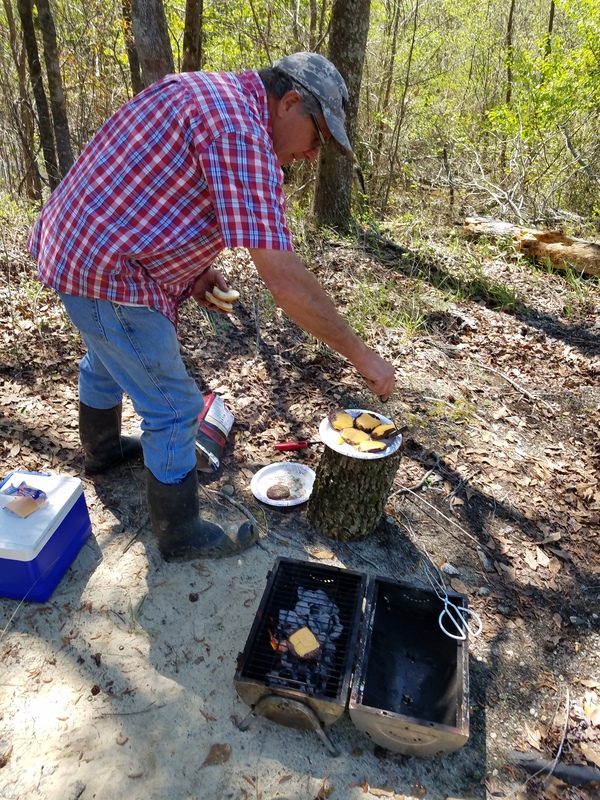 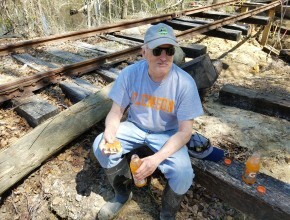 Chef John had brought and prepared a lunch of delicious hamburgers for the crew – aka Rail BBQ. 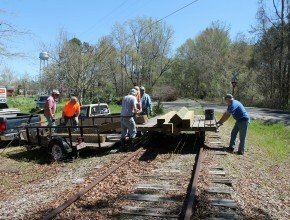 Many thanks go out to RSN April 1 Crew Members!!!!! 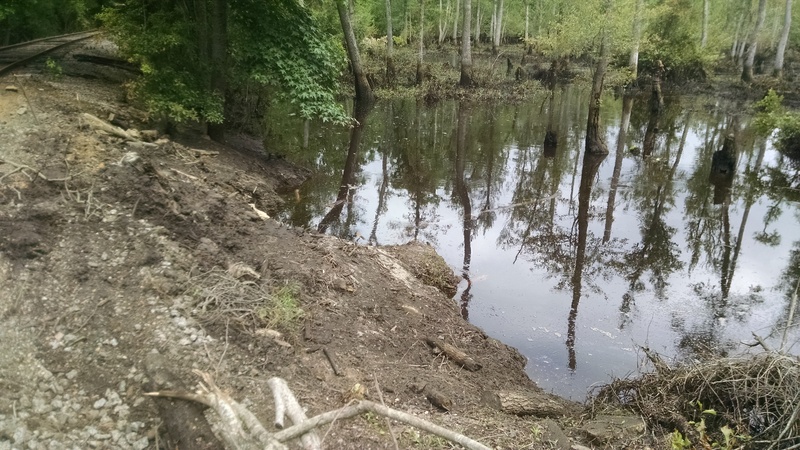 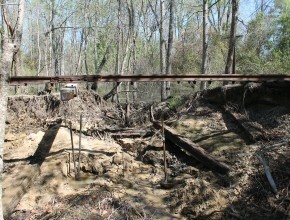 Washout report pictures by George Newport and Tom Stallings. 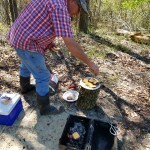 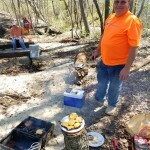 We enjoyed the on site cookout so much it was suggested we have a hot-dog cookout late one afternoon and a night ride. RSN again, busy as beavers at the beaver dam, working washout area on March 29. 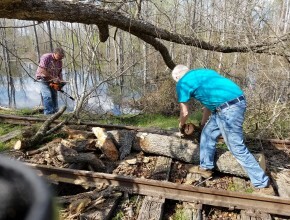 These guys are as persistent as the beavers working the washout area to get the railway open near the beaver dam. 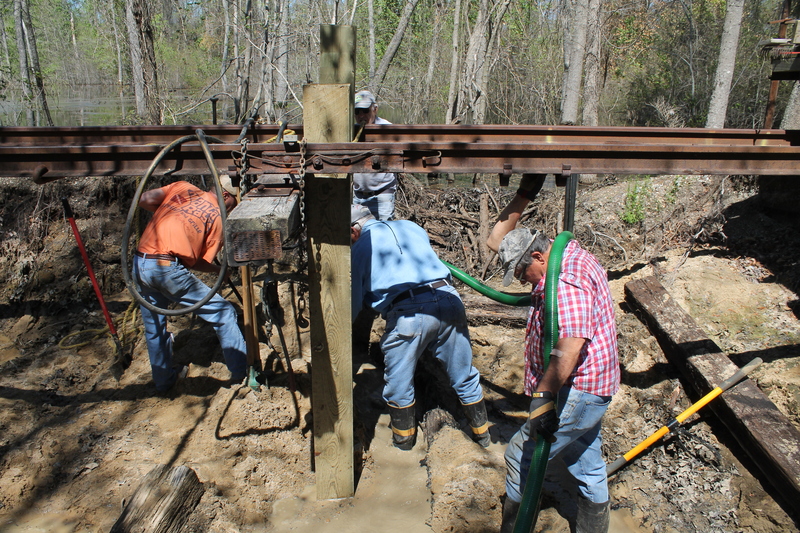 Thanks Mark Bullard, Phil Gandy and Tom Stallings – great job!! 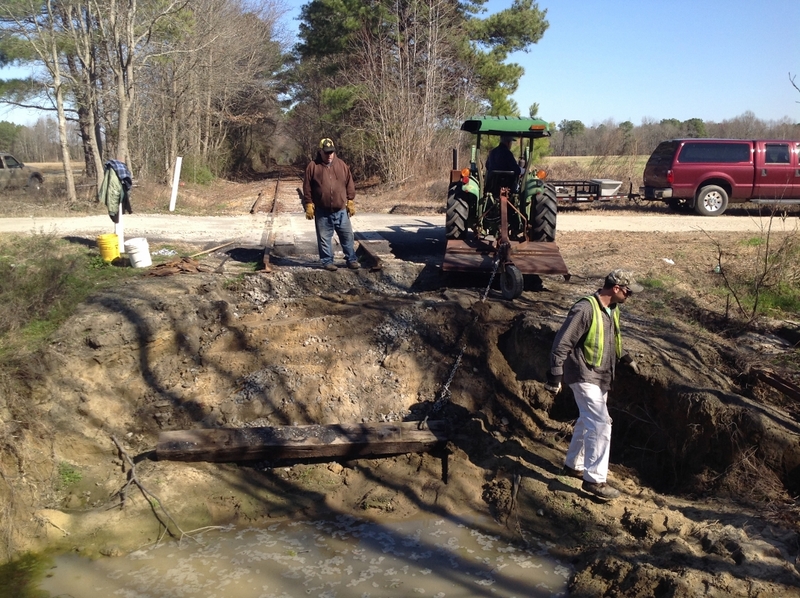 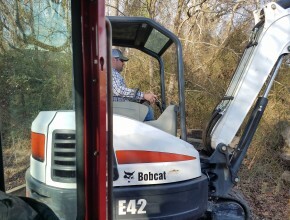 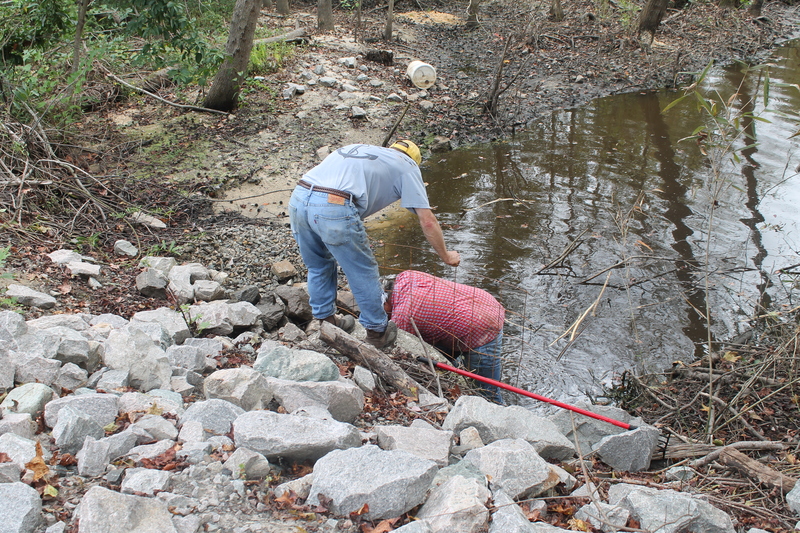 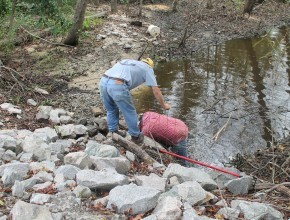 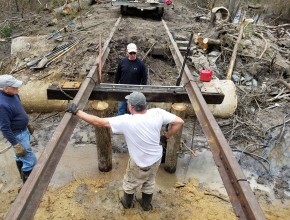 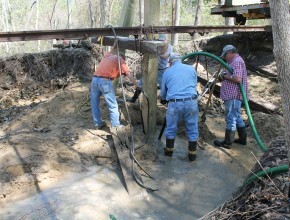 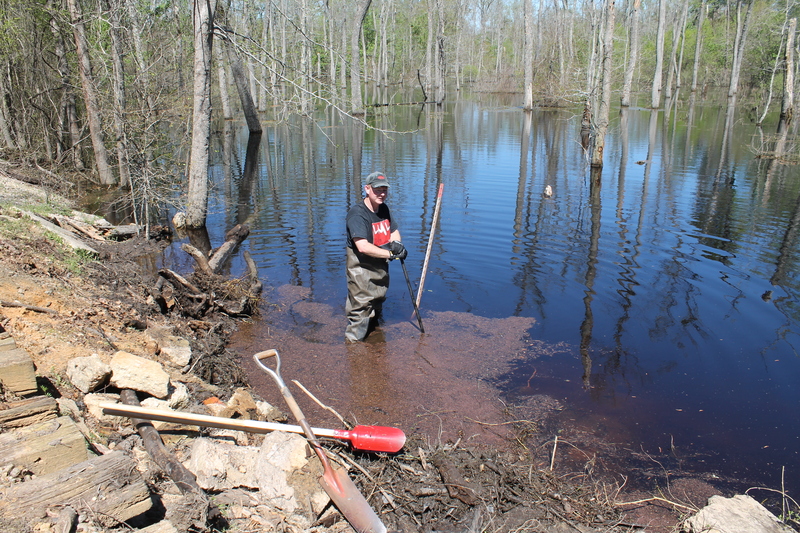 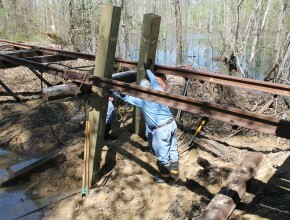 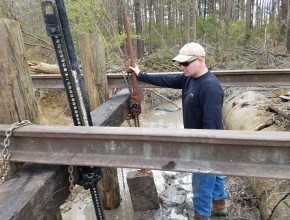 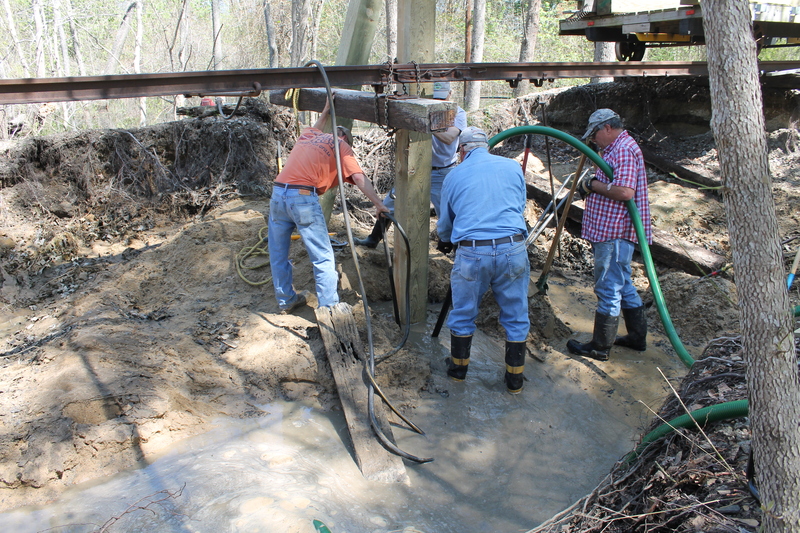 Another washout workday was held on March 11. 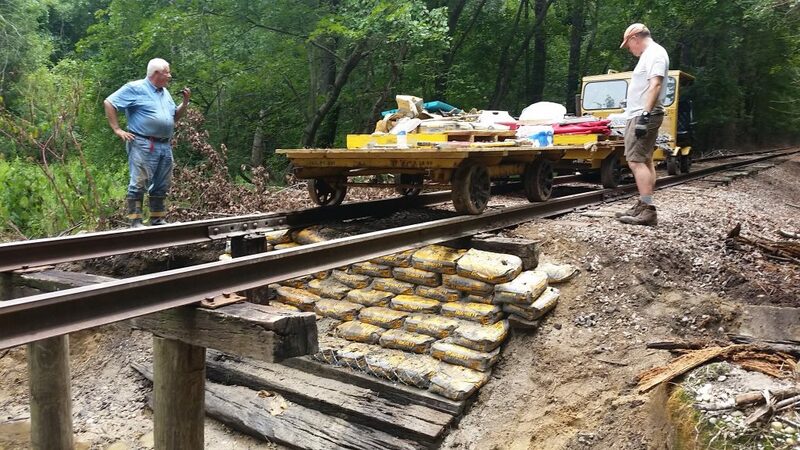 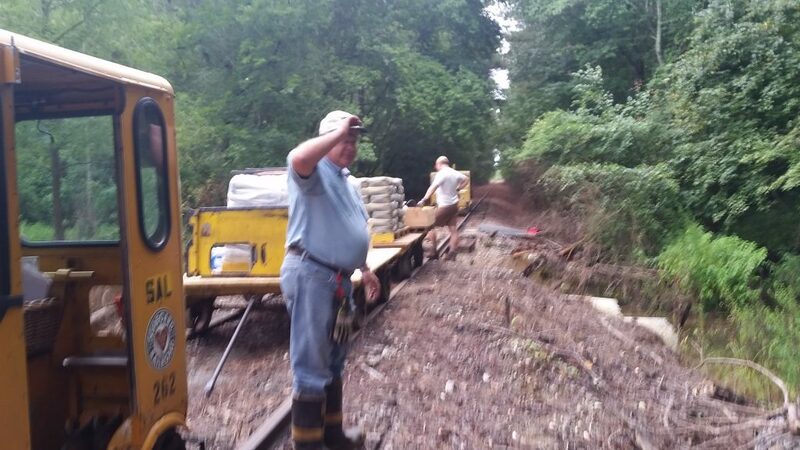 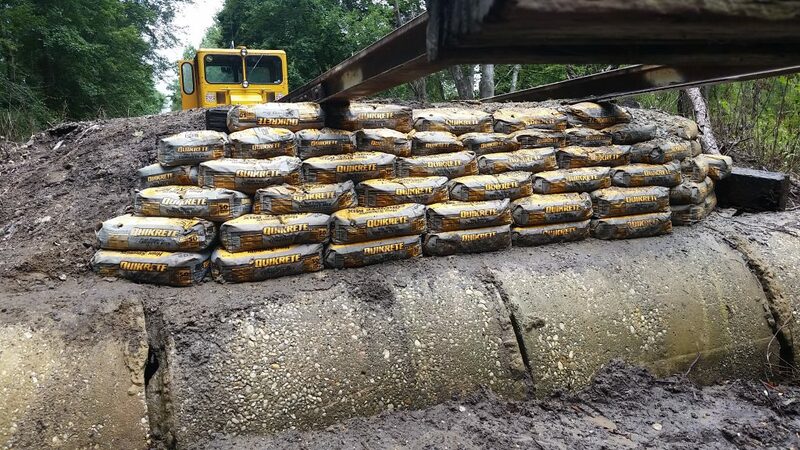 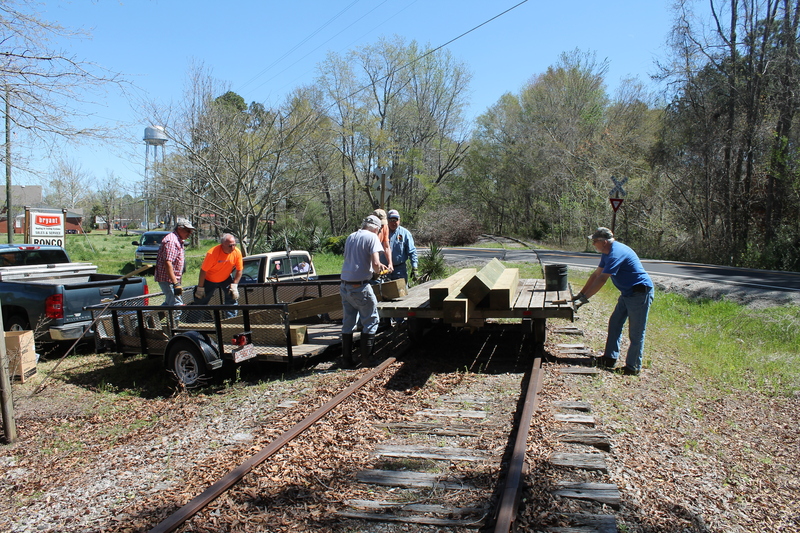 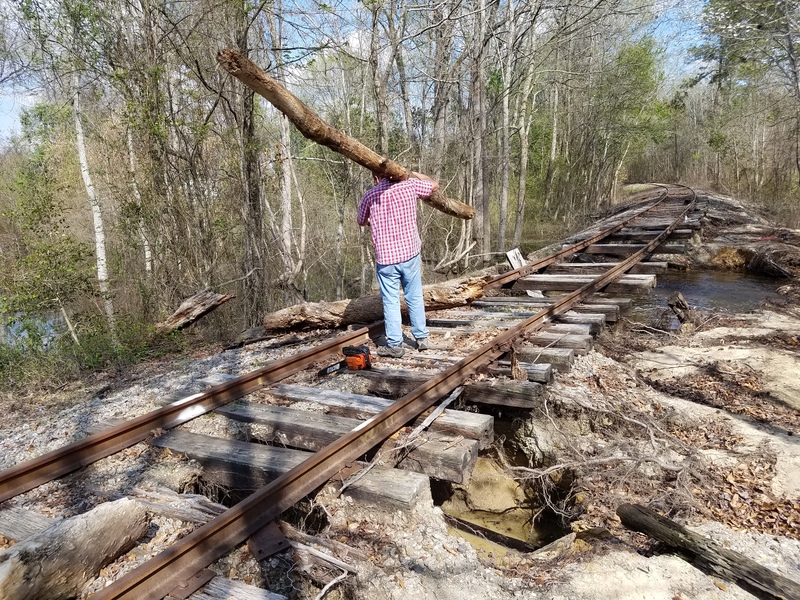 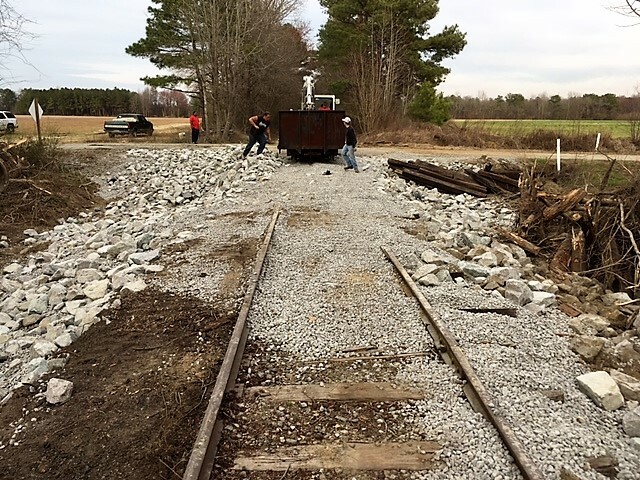 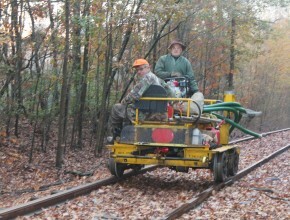 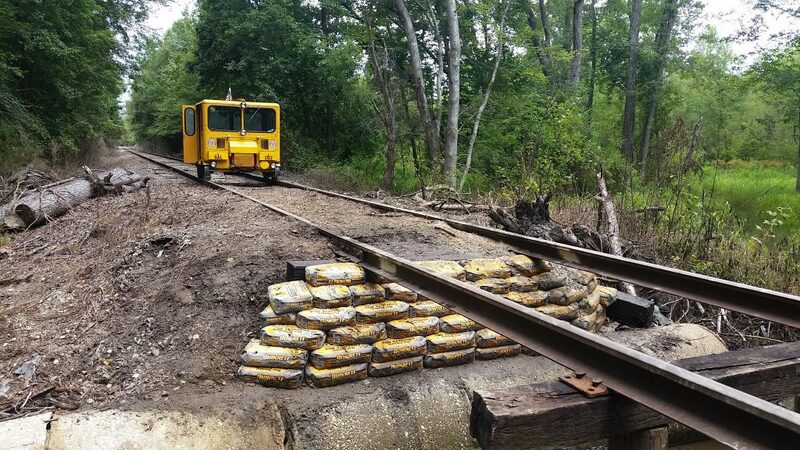 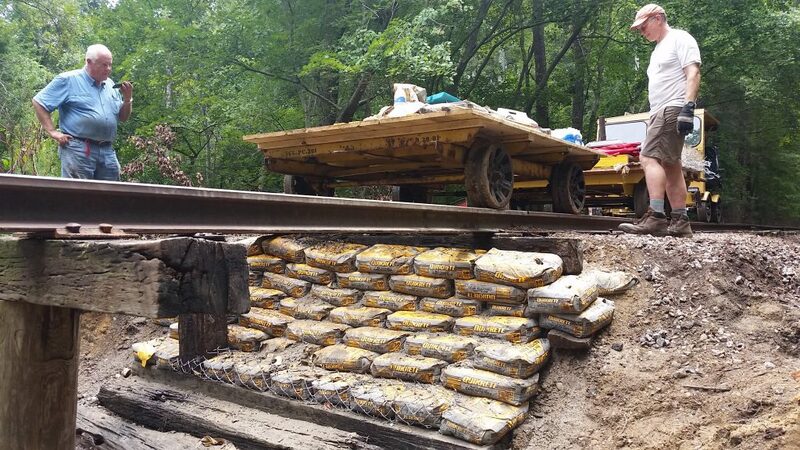 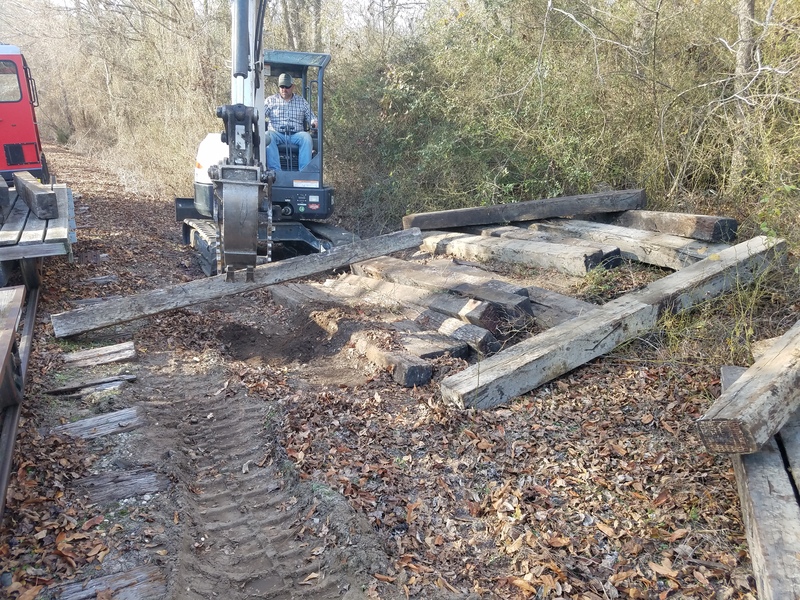 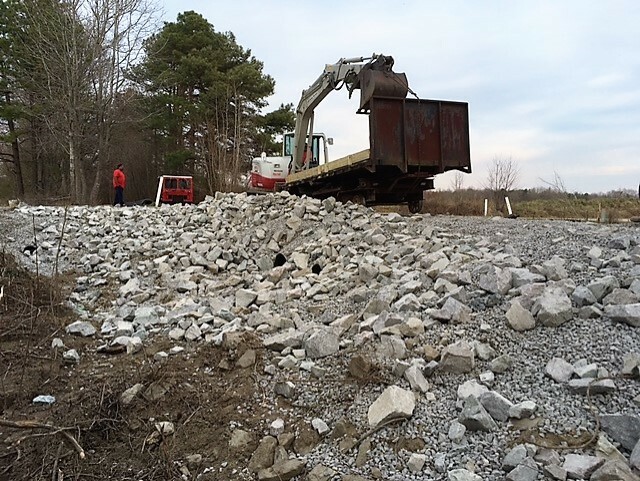 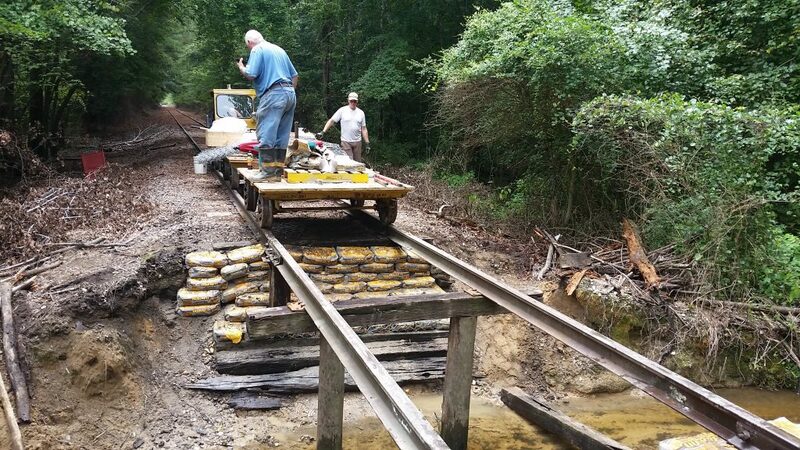 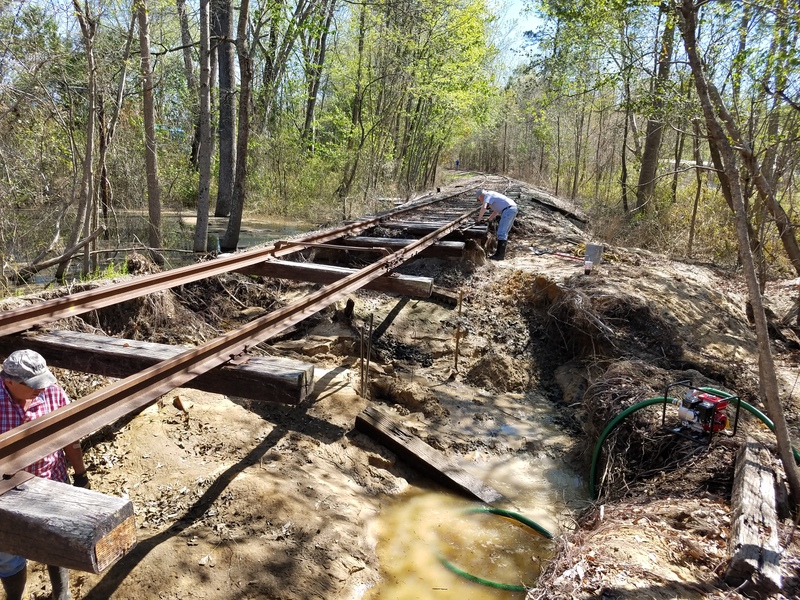 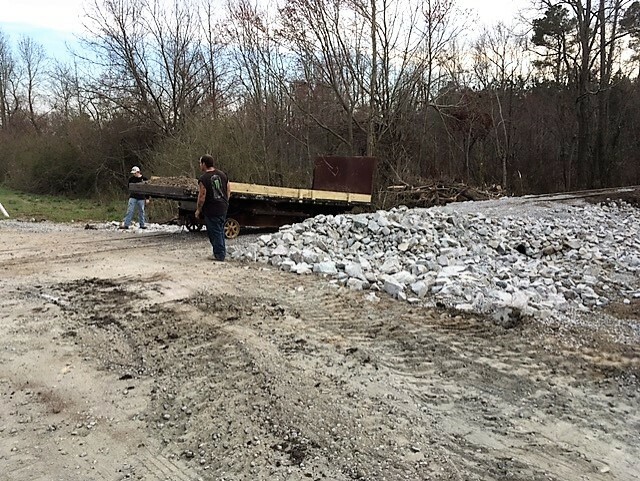 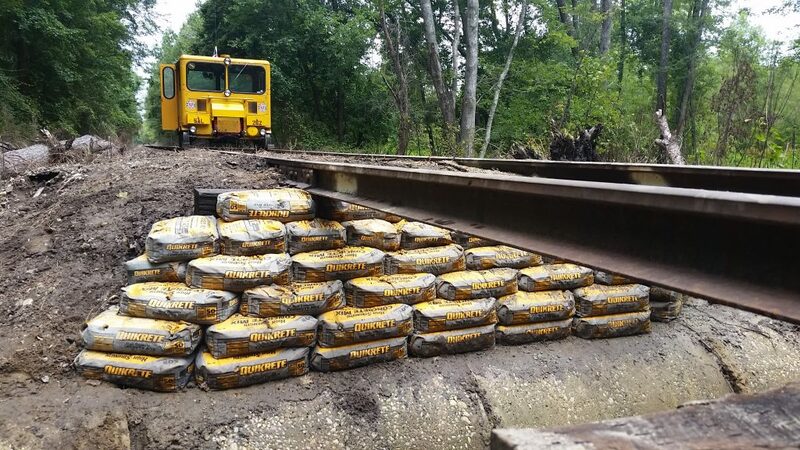 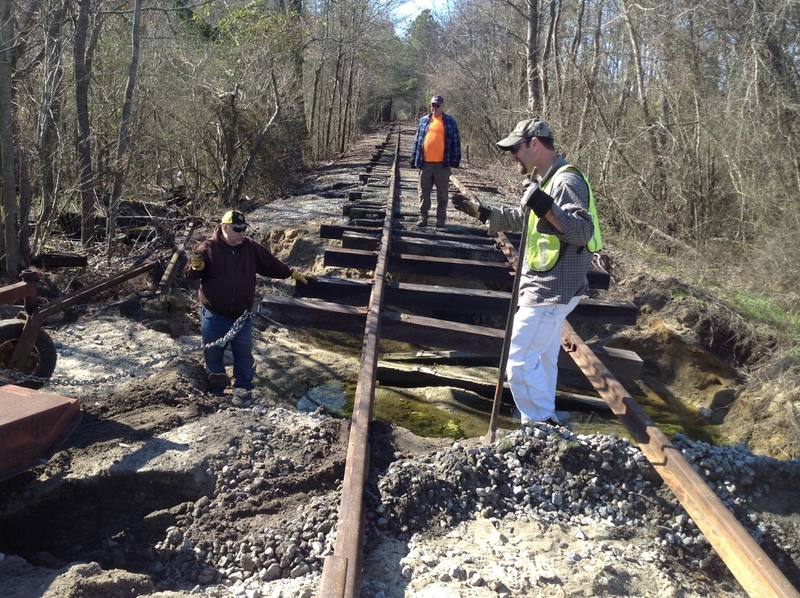 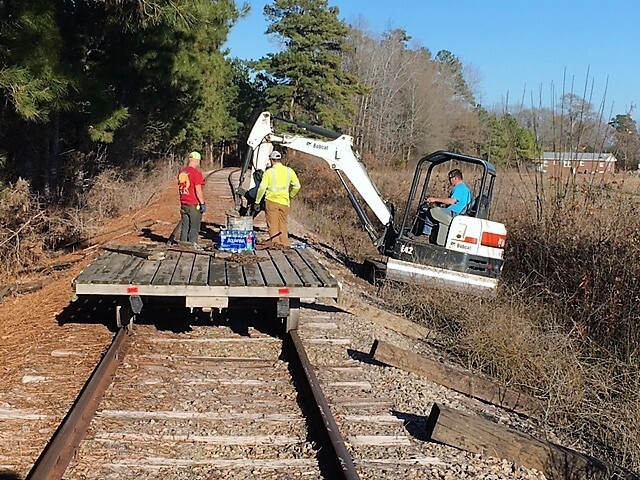 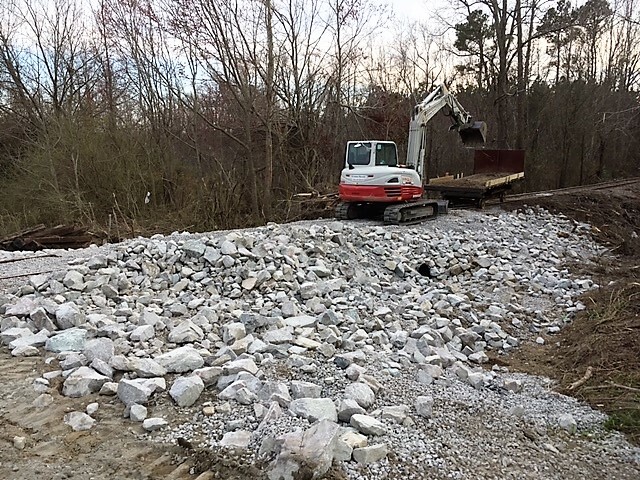 A big thank you goes out to Eric Massey, Tim Parnell, Mark Bullard, Phil Gandy and Tom Stallings for spending the day workin’ on the railway…. 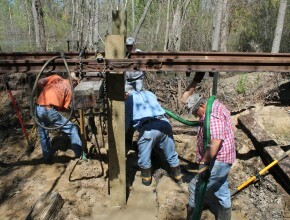 The group assembled Friday morning at the Green Equipment Facility to gather tools and supplies from the storage areas. 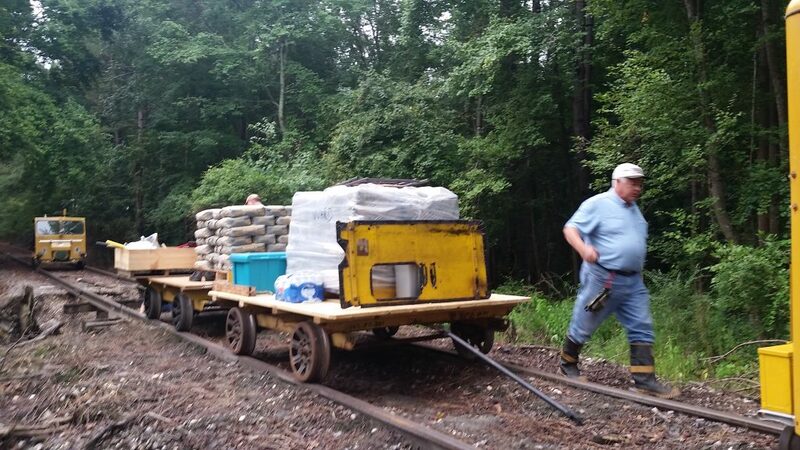 Phil loaded his truck and soon after Chris, and Screech did also. 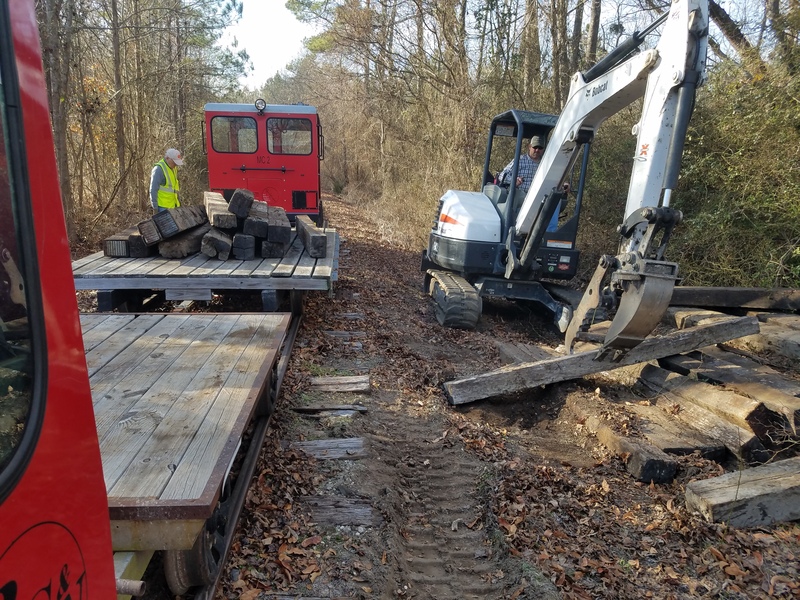 Everyone left the facility site and headed to the work site The rails removed for the Clearwater washout repair were replaced. 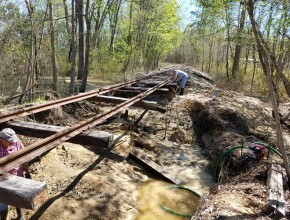 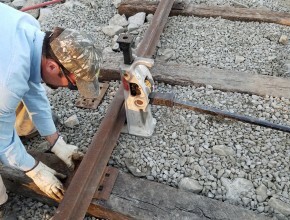 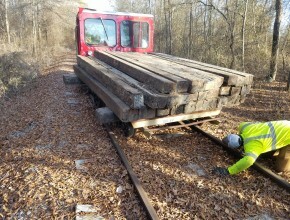 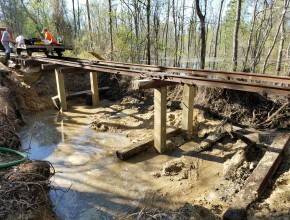 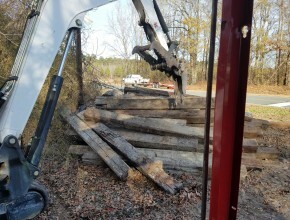 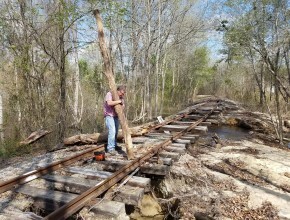 Site work consisted of removing the rails and cross ties that were left in place by the contractor doing the washout repair. 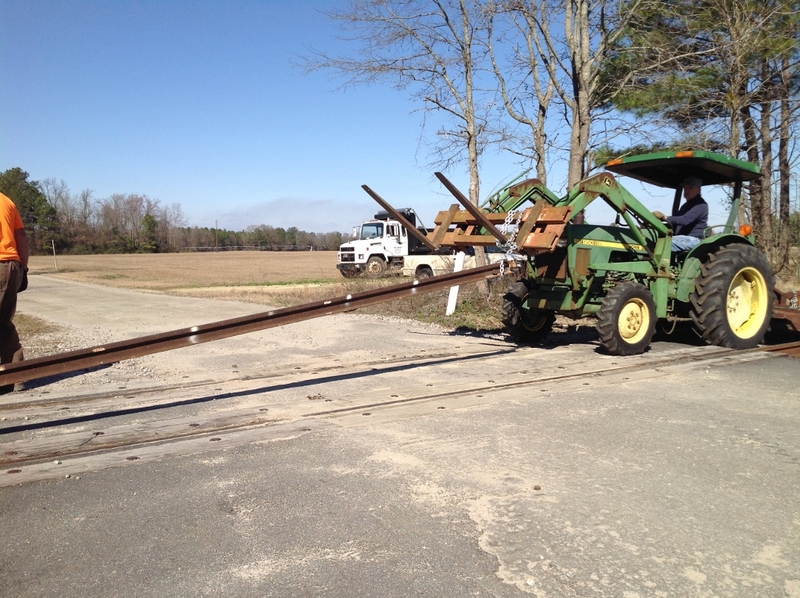 Then grading was needed to get the proper elevation for the cross ties to be placed. 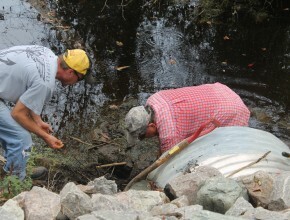 Tom stayed behind and replaced the stolen battery in the A4. 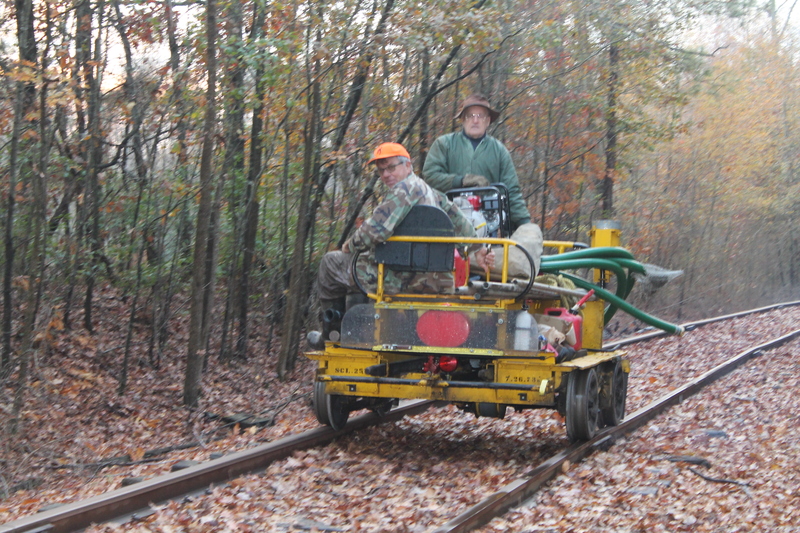 Safety checks were done on both motorcars and a test drive (ride) was conducted. 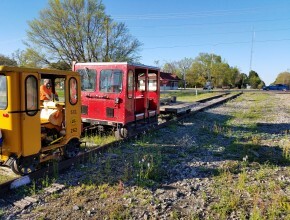 Both motorcars are ready for use. 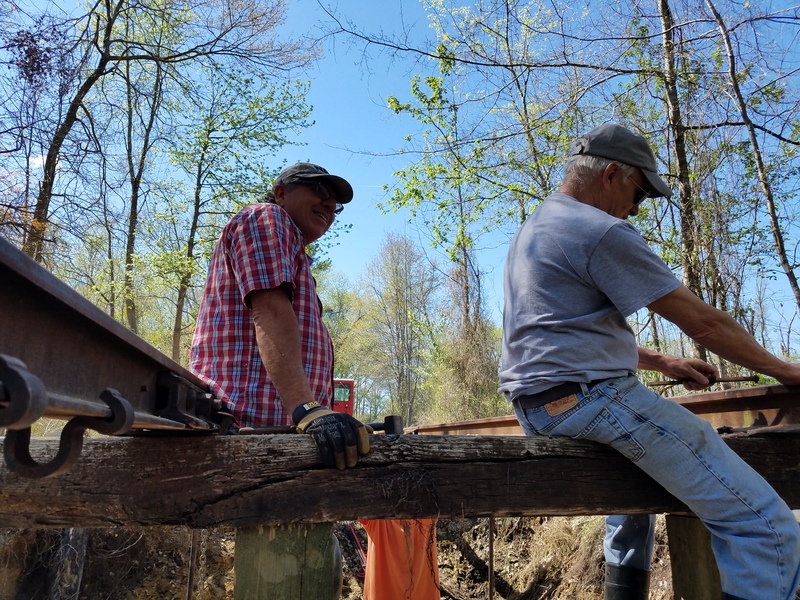 Thank you for those that attended the work day: Chris Abbood, Chris (Screech) Lanis, Wally and Rhoda Brown, Phil Gandy, Milton and Ginny Lucas, Jerry Parker, and Tom Stallings. 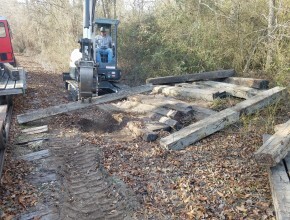 Below are pictures of work at Clearwater and Mountaire. 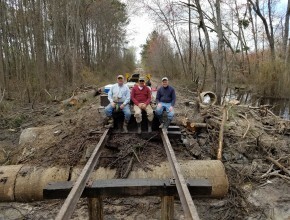 Great work by everyone – Thank you!!! Here’s a few pictures of our work session this past Friday, we started at 10am by gathering our tools at the containers in Red Springs, we proceeded up to Clearwater and set up our day. 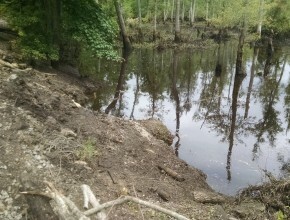 As you can see, after our safety briefing we had a very productive day and now the site is ready for repair. 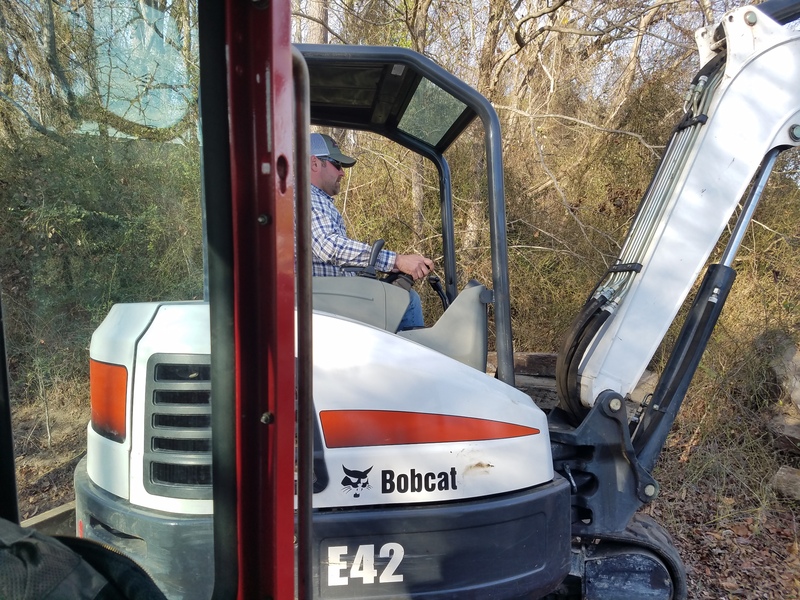 A BIG thank you goes out to members Phil Gandy, Milton & Ginny Lucas (who brought the machine), and our track guru, Chris Lainis and his better half Lori. 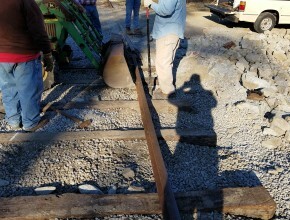 Everyone worked as a well oiled machine and got the job done in about 3 hours. I must apologize that I couldn’t be more help than I was, I am still fighting the lack of lung capacity following my bout with pneumonia over the holidays, thanks to everyone for picking up the slack! 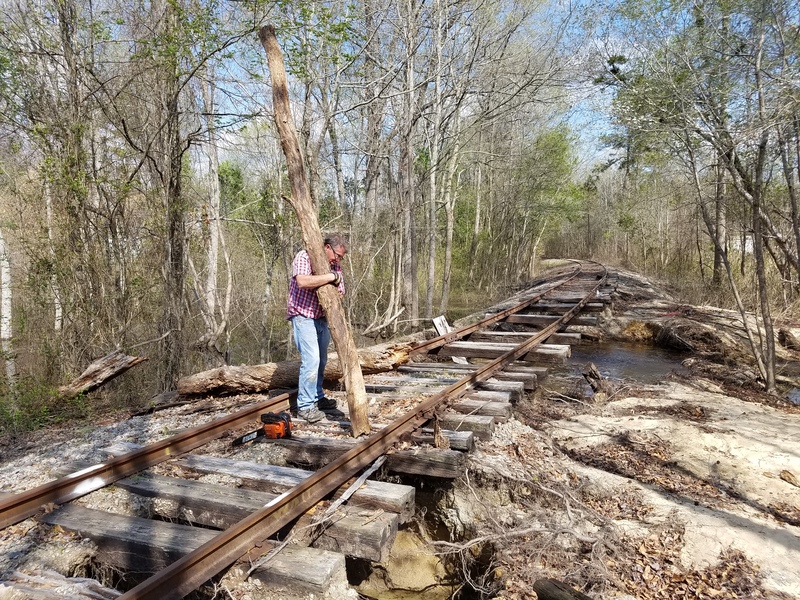 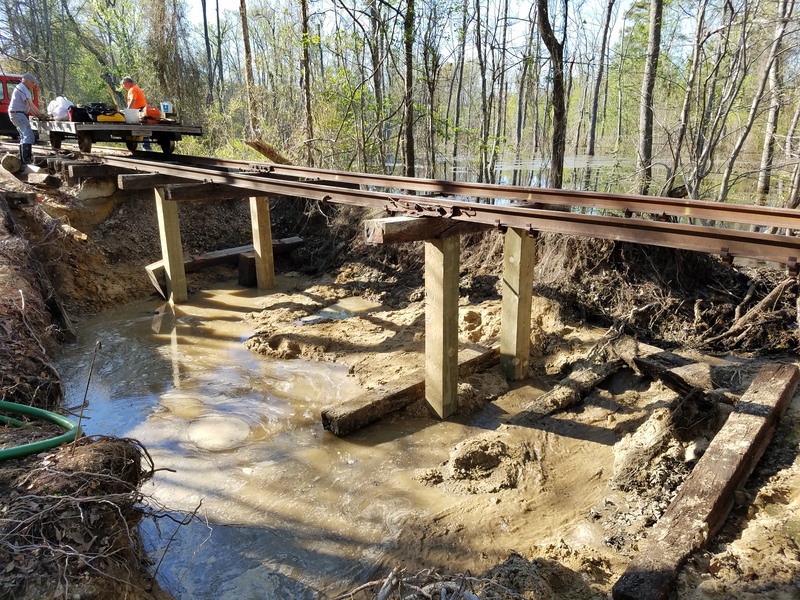 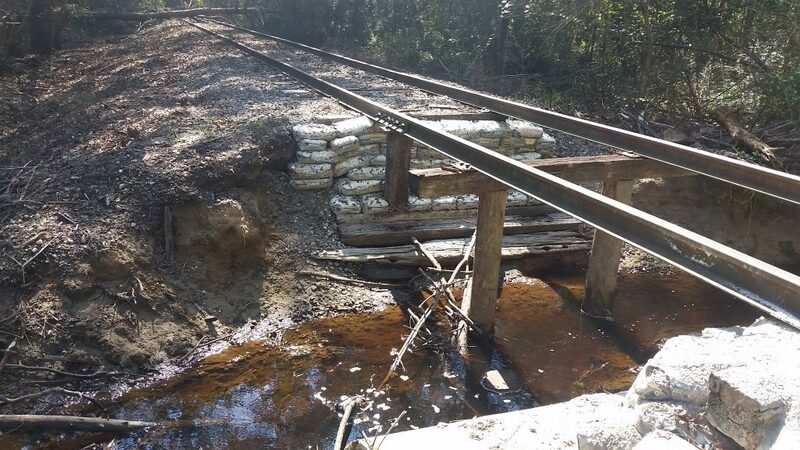 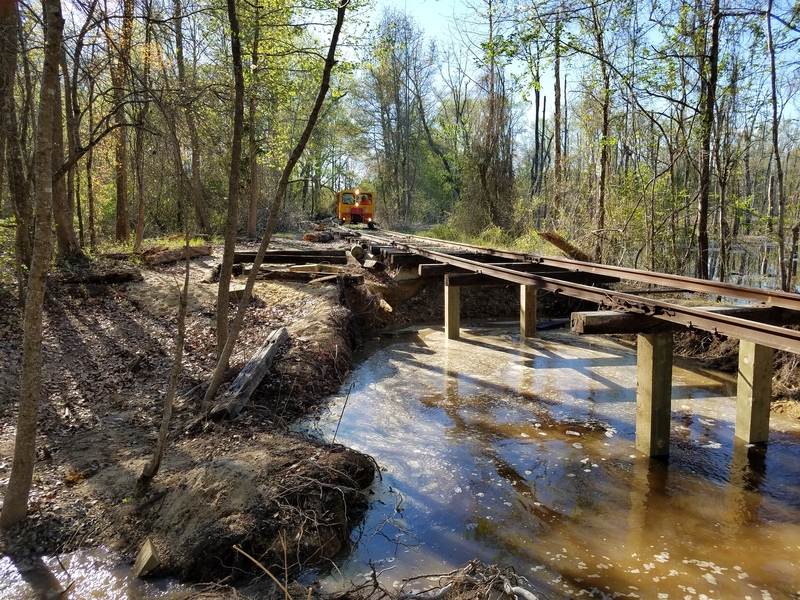 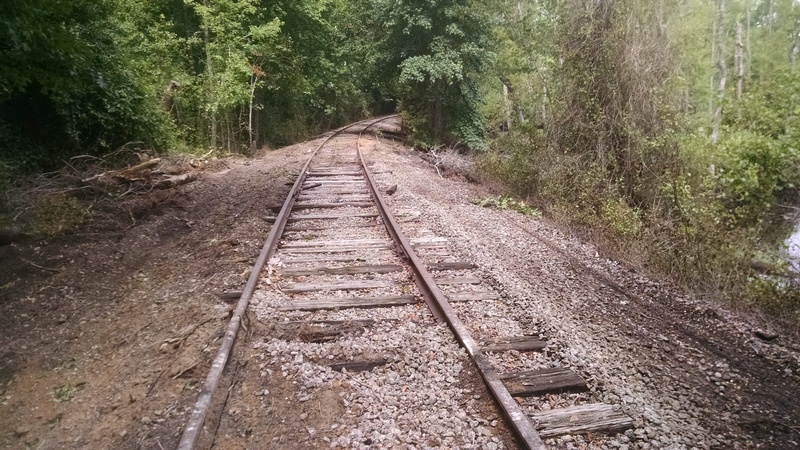 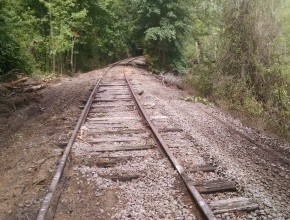 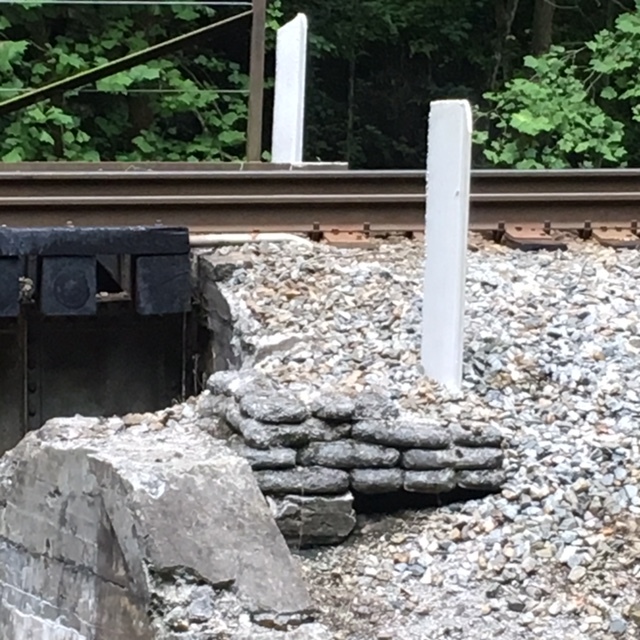 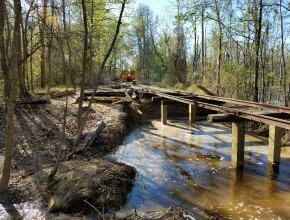 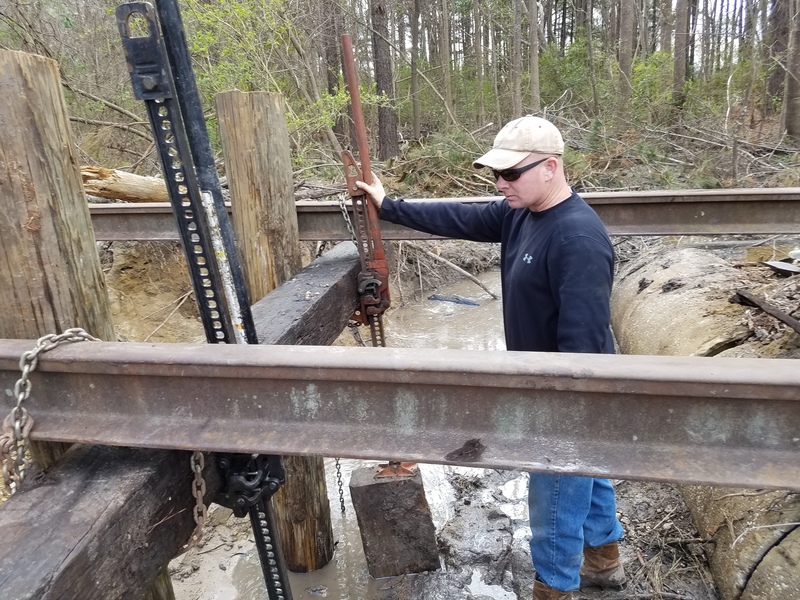 We are planning another work day to repair the damage at Wagon Wheel Road in a few weeks, we have taken measurements and have replacement rail on site,stay tuned for more information!